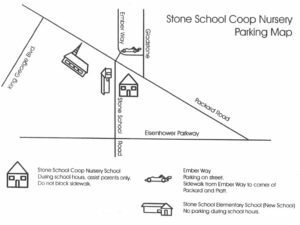 On school days, the parking place s next to the school building are for teachers and assist parents only. The drop-off/pick-up lane outside the school is for drop-off and pick-up only. When dropping off or picking up your child, please do not get out of your car. The Curb Parent or teacher will come out to get your child and walk them into school at drop-off, and will walk them to the car and strap them in at pick-up. If you wish to walk your child into or out of school, please park on Ember Way. To access Ember Way from the drop-off lane, turn right at the light on Packard Road. Make the first left on to Gladstone Road and turn first left on to Ember Way. You can park on the street a few houses in. There is a path that connects Ember Way to Packard Road near the crosswalk at Packard and Stone School. Please do not park at the high school across the street during school hours. Your vehicle may be towed.